It’s easy to fall in love with Dolsot Bibimbap. A beautiful, sunny egg yolk crowns the centre of thinly sliced beef and assorted lightly cooked vegetables arranged on a mound of sticky rice, in a heated stone bowl. You quickly mix the egg with the rice and vegetables using the heat of the bowl to cook the egg, which also acts as a sauce to hold the ingredients together. The first and only time I’ve had Dolsot Bibimbap was on a trip to Seoul in 2005. I’ve never forgotten it. I’ve had the regular bibimbap at Busaba in Colaba pretty often: the difference is that it’s served in a regular bowl and instead of egg yolk, it’s topped with a fried egg. It’s pretty good; not as memorable as Dolsot but quite tasty nonetheless. I’d never thought of making Bibmbap at home until recently. After watching Jiro Dreams of Sushi (a documentary on 85-year old sushi chef Jiro Ono who has spent his entire life perfecting the art of making sushi), I was looking for Tamago recipes on YouTube when I discovered Tamago Gohan, which is nothing but egg (tamago) beaten with soy and mixed with hot steamed rice (gohan). I’ve incorporated some of the elements of Burmese Kauswe, another one pot dish that I’m very fond of, like crispy onions, fried garlic etc to add a layer of flavour. 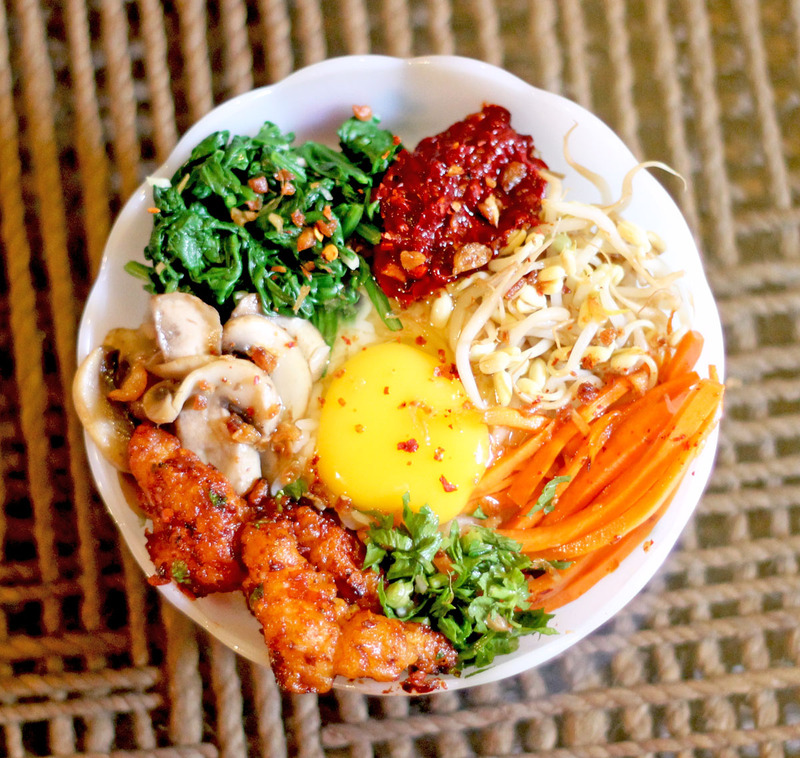 Bibimbap is usually served with a generous portion of gochujang, a sweet-spicy red pepper paste. Unfortunately gochujang is not easily available so I’ve adapted the recipe using local ingredients. And since I ran out of beef and pork, I ordered a Five Spice Chicken from the neighbourhood restaurant; a garlic chicken dry or Szechwan chicken dry will work just as well. – Make the chilli sauce the evening or a few hours before. The plain Kashmiri chilli paste (without the additional condiments) can be used in Indian gravies. – Wash and cut the vegetables. – Then wash and put the rice to cook. – While the rice is cooking, sauté and blanch the vegetables. By the time the rice is done you’re ready to serve. Boil the rice in double the quantity of salted water. Stir a couple of times to release the starch. Cook till it is slightly overdone and has a wet, sticky, khichdi-like consistency. Heat 1 tsp of oil in a frying pan on medium heat. Add a third of the minced garlic; fry for about 30 seconds, stirring occasionally. Add the mushrooms. Stir-fry for about 2 minutes. Add 1 tsp of light soy sauce. Cook till the liquid evaporates. Remove and set aside. Drizzle about ½ tsp of sesame oil over. Top with sesame seeds. Wipe the pan clean. Follow the same steps for the carrot. In a sauce pan heat some water till it starts to boil. Lower heat to simmer. Blanch the spinach leaves in the water for about 45-60 seconds. Remove, refresh in a bowl of ice-cold water. Drain and roughly chop. Add the remaining garlic, 1 tsp of light soy, ½ tsp sesame oil and a pinch of salt. Mix well. Top with sesame seeds. Blanch the bean sprouts in the same simmering water for about 2-3 minutes. Remove, refresh in a bowl of ice-cold water. Mix in ½ tsp of light soy and a pinch of salt. Drizzle ½ tsp sesame oil. Divide the steaming hot rice into two round broad-bottomed bowls. Drizzle half a tsp of sesame oil over each portion. Quickly arrange half the spinach, celery, mushrooms, carrots, chicken and chilli sauce around the edge of the bowl. Keep the rest aside. Break an egg in the centre. Sprinkle some of the fried garlic, crispy onions and chilli powder over. While the rice is still hot mix everything together well. Add the reserved meats, vegetables and sauce as you go along. Remove the stems and deseed all the chillies (if you want it spicy deseed only 8). Boil in water for about 10 minutes. Remove and keep aside to cool. Grind the rehydrated chillies till you have a smooth paste. Put the paste in a mixing bowl. Add the remaining ingredients except the sesame seeds and mix well will smooth. Finally add the sesame seeds and mix well. Keep covered for a couple of hours to let the flavours infuse, or in the refrigerator overnight. It should be spicy-sweet; more spicy, less sweet. Refrigerated it should keep about a day or two. The best part about you Antoine, you very innovative when you trying out new recipes 🙂 And thanks a ton for sharing it! This looks mouth-watering! I’m sure it won’t turn out exactly as is pictured here but I’ll try. Of course it will Ro. It’s dead easy.